Andrea Soda was born in southern Italy, near Provenza, in 1877, and came to America in 1907 with his wife Margherita (nee Argenta). He was listed in the 1908 directory as a cement worker. By 1912 he was living at 1137 65th Street, the address shown in his sidewalk stamps, and was the father of three children. He went by the name Andre or Andrew, and his wife likewise was called Marguerite or Margarita. His draft form from 1917 described him as a man of medium height and build, with blue eyes and dark hair and not yet a naturalized citizen. I have documented his marks from 1913 to 1937, all using the stamp shown above. The Tribune records him bidding on various jobs under the name A. 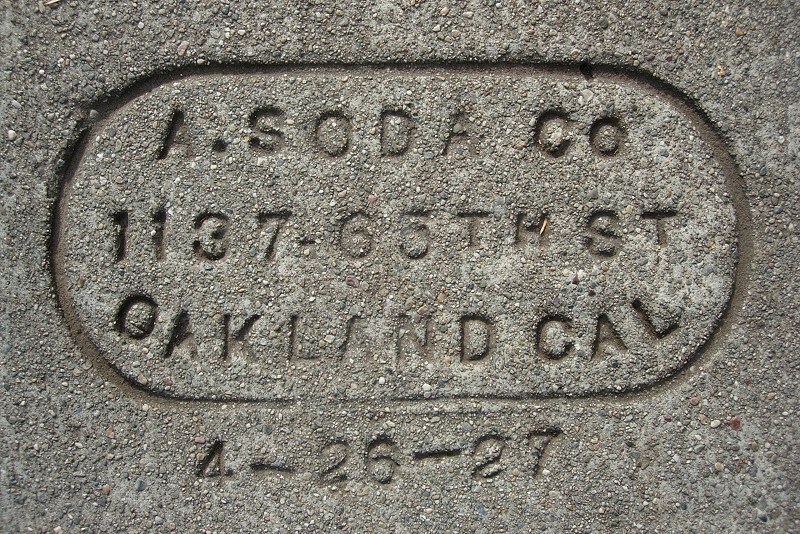 Soda Company from 1928 to 1931 and A. Soda & Son (or Sons) from 1932 to the 1950s. (His sons were Yster Charles (“Y. C.” or Chester), born in 1908, and Stephen, born in 1912.) The company’s contracts grew in size over the years and came to focus on small bridges around Northern California. On 5 November 1936, the firm was retimbering the old high-level tunnel above today’s Caldecott Tunnel when a collapse killed one of his workers. The paper quoted Y.C. as saying the firm had never, not once had such an accident before, and also noted that his workers kept photographers away from the scene. By this time Andrea had moved to Sacramento Street in Berkeley, with Chester still living at the old homestead. By the 1940s Andrea had retired from the Soda firm and was running a liquor store at 6324 San Pablo Avenue. He died in 1948. Several family members, including Margherita, are entombed in a family crypt at Holy Sepulchre Cemetery in Hayward, but I can’t tell if he’s there too. I was prompted to compose this post by spotting an A. 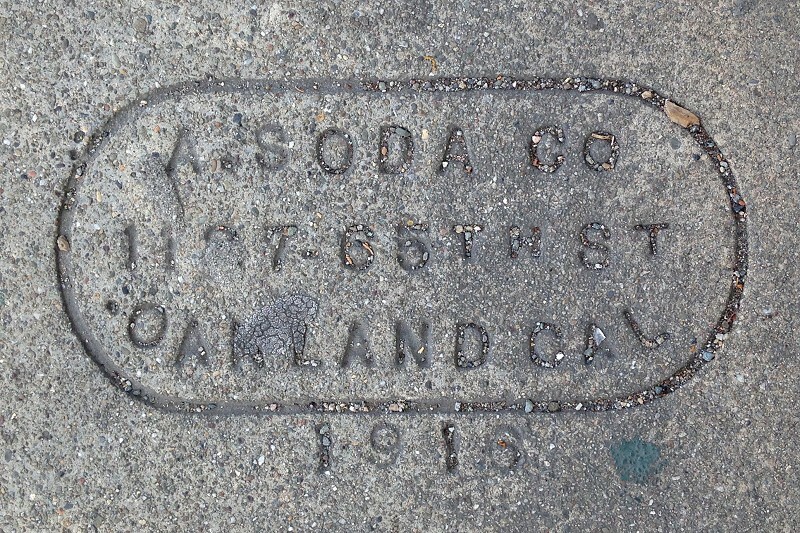 Soda mark in Berkeley from 1916, a year not found in Oakland. This entry was posted on 13 October 2017 at 8:03 am and is filed under Profiles, 1916. You can follow any responses to this entry through the RSS 2.0 feed. You can skip to the end and leave a response. Pinging is currently not allowed. was researching the name on a stain glass window at St. Columba Church at Ocean & San Pablo Ave–Margherita Soda–and found this entry helpful. To fill in a bit more . . . Andrea’s son, Y. Charles Soda (born 1908) is the Chet Soda who became a prominent Oakland businessman, head of the Port of Oakland, one of original owners of the Oakland Raiders, and along with his wife Helen, founder of the Y & H Soda Foundation (with buildings named after them on UCB campus, St Mary’s college, Holy Names University and I believe CSU East Bay).